After the Japanese defeat to the Russians in the last episode, Kaji, the Japanese soldier and humanist protagonist, leads the last remaining men through Manchuria. Intent on returning to his dear wife and his old life, Kaji faces great odds in a variety of different harrowing circumstances as he and his fellow men sneak behind enemy lines. Ultimately, he finds himself in the exact opposite position he held in the first episode: then a labor manager, Kaji is now a prisoner of war, forced to work for the Russians, whom do not seem to hold to the Communist ideals in which Kaji himself had put his faith. 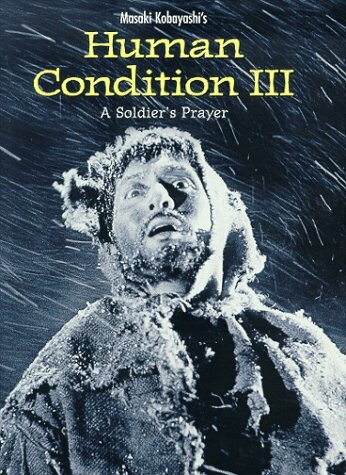 A Soldier's Prayer is the third and final chapter of Masaki Kobayashi's The Human Condition trilogy, following No Greater Love and The Road to Eternity. An immense ten hour long epic, The Human Condition is one of the most staggering achievements of Japanese cinema. The series, originally filmed and released in three parts, tells the tale of the well-intentioned yet naive Kaji (Tatsuya Nakadai) from labor camp supervisor to Imperial Army soldier to Soviet POW. Constantly trying to rise above a corrupt system, Kaji time and again finds his morals an impediment rather than an advantage. This final film is the best of the three. Building on the strong acting from Tatsuya Nakadai, and consistently impressive cinematography and direction, Kobayashi takes the trilogy to a powerful conclusion. 10 hours, would definitely need to watch this in installments. I'm definitely going to watch this series some day.